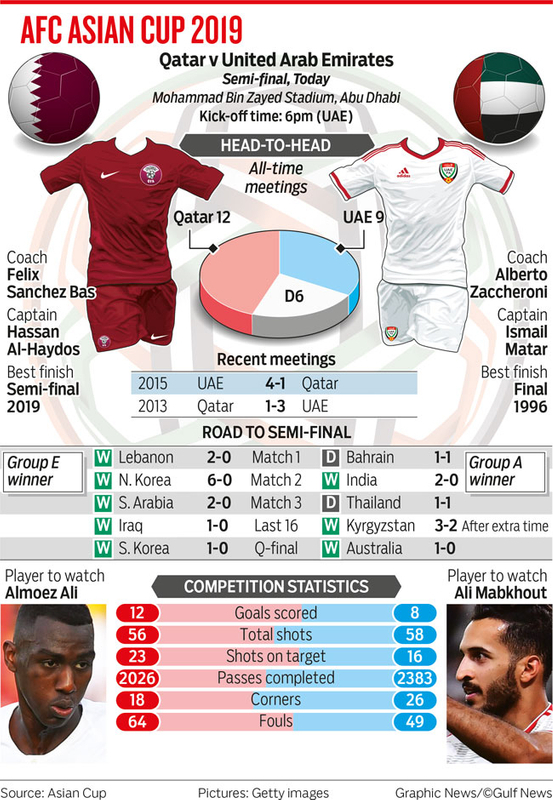 Abu Dhabi: Hosts UAE will be taking on arch-rivals Qatar in a pulsating AFC Asian Cup semi-final encounter at the completely sold out Mohammad Bin Zayed Stadium on Tuesday. The excitement is palpable — and so is the anxiety and pressure that accompany a high profile outing such as this. Ticket-hunters were still dashing to the stadium on the eve of the encounter on Monday, to try their luck, but could be seen returning dejected. UAE faced some difficulties in earlier matches especially, against teams that defend well, but the team is evolving, and we performed really well. Social media was abuzz — as fans from both camps traded the typical sports banter — with the contest being seen as a face-off between two outstanding forwards of the competition, Ali Mabkhout and Almoez Ali. UAE striker Mabkhout, who won the golden boot in the last edition with five goals, has already scored four and is in line to become the first player to do a repeat. He will be playing at his familiar club team Al Jazira’s turf. Qatar’s Ali has so far scored seven goals in five matches, including four against North Korea, and he is now just one goal behind Iranian Ali Daei’s record for a single tournament. With so much riding on this game, either side would be well aware the outcome of the game will largely depend on who handles their nerves better. The hosts haven’t been at their dominating best but were effective in winning those crucial moments to get them through to the last four. Under coach Alberto Zaccheroni, they have a shrewd tactician and the home fans will be hoping that the Italian will have plenty up his sleeves to stun the maroon brigade. The Whites’ quarter final victory against Australia would also have done a world of good to their morale and Zaccheroni is confident they will continue in a similar vein in the semi-final. “UAE faced some difficulties in earlier matches especially, against teams that defend well, but the team is evolving, and we performed really well in the previous match against Australia,” Zaccheroni said. He said they were treating the encounter as a final game. “I’m well aware of the difficult game we are facing, but I am confident we can win if we put in a good performance tomorrow,” Zaccheroni said at the prematch press briefing. “Qatar, in my opinion, is a strong and well-organised team that hasn’t conceded yet. They performed well in the tournament and even throughout last year. We will be highly focused in order to reach the final,” asserted the 65-year-old, who has some injury worries to deal with. Esmail Al Hammadi, Mohammad Ghraib and Fares Juma have suffered body blows during the contest against Australia and it will be interesting to see how much these players have recovered. However, UAE will have the services of Khamis Esmail, who served a suspension against the Socceroos. Qatar’s last win against UAE came way back in 2001 in the qualifiers for the Fifa World Cup in South Korea and Japan. Having said that, Qatar have been a revelation in the tournament and have stormed into the last four unbeaten and more importantly — without conceding a goal. Qatar coach Felix Sanchez will also be missing the services of both goalscorers Bassam Al Rawi and Abdul Aziz Hatim with suspensions, but Omer Madibo and Abdul Karim Hassan are back in the squad. “Losing two players at this stage of the game to bookings or injury is common. I think one of the strong points in the team is everyone is ready and waiting for a chance to go in and help. “In the last game, we were excellent. I hope tomorrow will be a good game for us and we will have the performance to win the game for us,” said Sanchez.